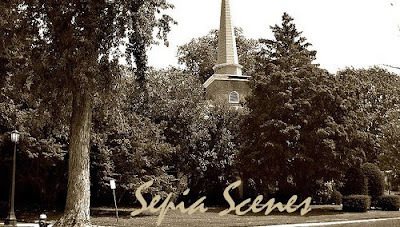 WELCOME once again to Sepia Scenes! On the way to Socrates Sculpture Park on the last day of a contemporary art exhibition we drove directly under the 59th St. Bridge. I made my husband stop the car, pull up a little so I could get the shots that you see here. 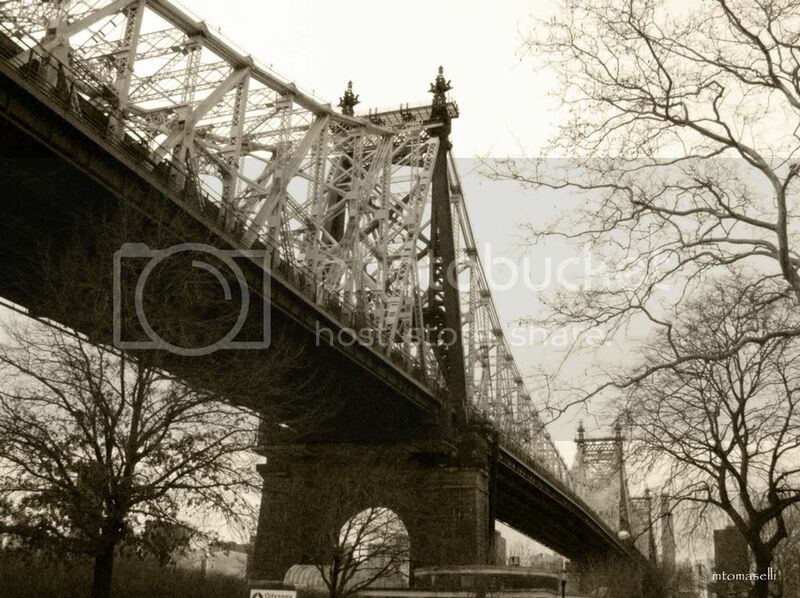 The Queensboro Bridge is undergoing a major rehabilitation. Annual average daily traffic is 192,000 vehicles. Fabulous bridge shots Mary! I love that song, haven't heard it for ages. Life I love ya, all is grooooovy! 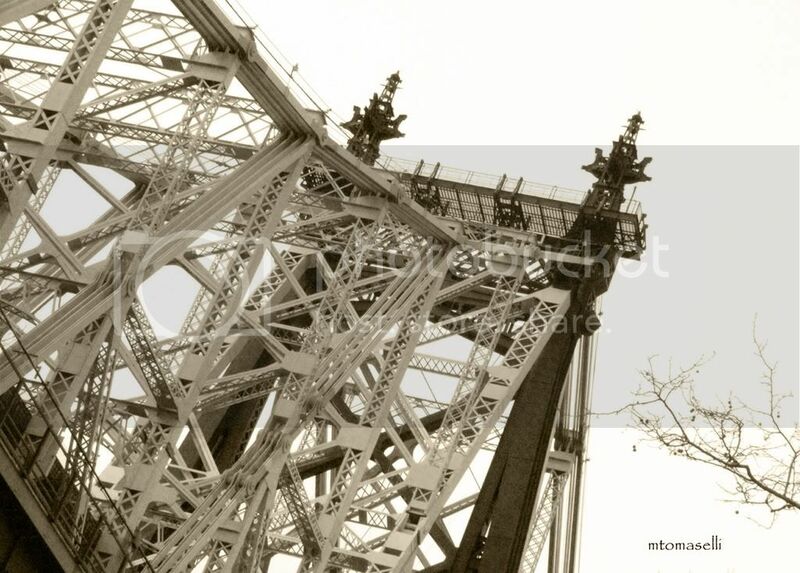 Great steel structures. Has Mr Linky disappeared again? OMG. Mary... this is spooky. I like the perspectives in these beautiful and nostalgic photos. The bridge brings back memories for me...of my childhood. That's a LOT of cars every day! What a wonderful old part of history! From movies, to the news out of New York this bridge has been a part of all of our lives. I hope the rehabilitation doesn't destroy the essence of the original. Hope you're having a groovy week Mary! Thanks for the song! My Sepia post is on my photoblog: Carletta’s Captures. "Slow down you move too fast..."
A very ornate iron structure. The spans of NYC are unparalleled in their style and grandeur. From the GWB to the Triboro to the Queensboro, the style is outstanding. The rivers in CT aren't wide enough for substance spans like you see every day! PS: I hope this bridge remains toll-free! I luv the architecture of the bridge. It's so intricate. Beautiful shot! Thanks so much for your comment pointing to this entry. I've always been a bit of a bridge freak...had David Plowden's "Bridges" book on my coffee table ever since I can remember. I'm not sure why I'm thus addicted, but it makes for cool photo opps. These are masterful captures of a masterful piece of engineering. Thank you for sharing something I've seen so many times before, but never experienced as richly as I have today. Interesting history of a graceful bridge. Best wishes. Another amazing sepia photo, Mary. I HAVE to work more with other tones for sepia. As always, you lead the way. A wide huge and that's a very well used bridge with so much cars passing by everyday. The interlacing structure is pretty amazing and itself a piece of art already. Hi... this is my first time here at Sepia Scenes. Great shots of the bridge - you have left me feelin' GROOOOVY! UGH! I LOVE those pictures and I LOVE that song -- as a matter of fact that whole album!!! GREAT shots Mary! Mine will be up in about 45 minutes! They're scheduled! Marvelous shots Mary! sorry I couldn't play this week. But it's been a very hectic week for me in real life. Great pictures of a great bridge! This bridge is such a grand, proud old lady! Great to link the photo and the song! Love these photos! Awesome photos!!! Are those blinking lights on the very tip top of the arches? The kind that let airplanes see them? That what they look like to me. Mine is posted. It's a wedding! Have a great day!! For once, I had mine up before you, then after 4pm got here I had a headache and took a nap and then never turned the computer back on so mine is late even though it was early and your bridge pics are cool and how's this for a run-on sentence, teach? Dear Friends, thank you for all your prayers and encouragements. It means a lot to me in this time of loss. Best wishes. I woke up this morning and realized I never came back to link my post. Mr. Linky wasn't here Wednesday afternoon when I came by. Yikes, I guess I was busy yesterday. Mary The Teach you have quite the blog. I'm so glad PJ pointed me here. Good taste in music, too. Love the bridge shots and the song. Nice photos! I live on Long Island and never really knew anything about this bridge, except to call it the "59th St. Bridge"! Thanks for the interesting post. I'm contemplating joining the meme. Is it "okay" to miss some weeks? "Groovy...." Boy, does that bring back (OLD) memories!